May 2007. Interesting geologic event along the Mt. Jefferson section of the Pacific Crest trail. Reported to me by a USGS hydrologist. 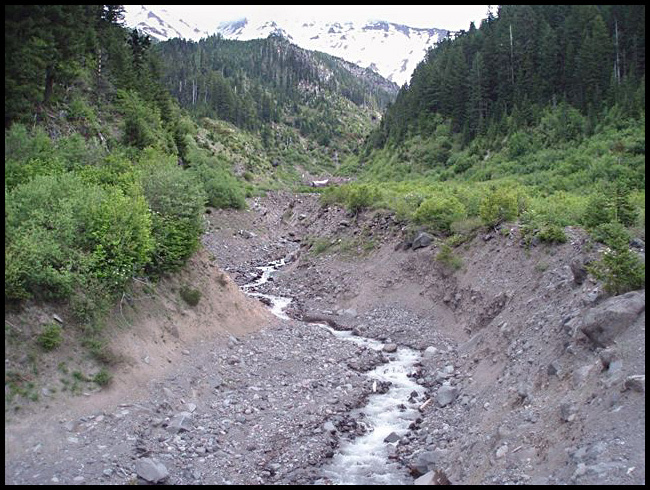 The Milk Creek crossing has been wiped out by a glacial outflow event. 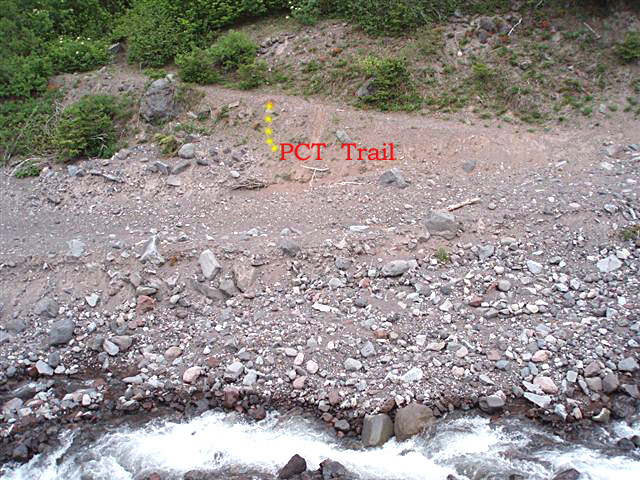 Along the rugged fastness of the PCT's 441 mile Oregon route, geologic events can and do occur, and some of them can be dangerous and destructive! High on the SW side of Mt. Jefferson lies an extremely steep glacial cirque craddling a tiny residual glacial called the Milk Creek Glacier. During the record-setting torrential rains of November 2006, a glacial outflow flood burst forth high on the peak, wiping out the PCT crossing at 4,200 feet, and continuing downstream many miles, also affecting several portions of the Pamelia Lake Trail...Repairs are slated for this summer.....Luckily the flood occurred during a time of the year when usage is very sparse, and no one was injured. Two recent pictures of the Milk Creek trail crossing are below. Courtesy of USFS. The picture above looks upstream from approximately where the PCT crosses Milk Creek. Here we are at about 4,200 feet. It is likely that the glacial outburst came from the snout of the glacier, which lies well above 8,000 feet. Such a flood has incredible momentum and power. One can only imagine the sound as hundreds of tons of fast-moving rocks and gravel scoured out this canyon in the space of (rough guess by me) a hour or less. Such events can occur for a variety of reasons, and sometimes there is nothing to predict the occurrence of such a flood--- so there's a nother good reason not to camp right next to streams! Link to a mountain story, "Windstorm on Mt. Shasta"
If you enjoy trail stories, you will LOVE "Listening for Coyote," by the Eugene-based writer William L. Sullivan, a Henry Holt Owl Book, 1988. In it, he describes his solo backpacking journey across the breadth of Oregon from the Coast to the Snake River, in the process traversing both the Siskiyou Mountains and a large portion of the PCT. The Official Pacific Crest Trail Association is based in Sacramento, California. They are THE organization to join if you are interested in the preservation of this 2,650 mile-long National crown jewel of trails! Here is a link to the "Trails Condition" portion of their extensive website! Page Last Reviewed 6/05/2018 -- there are miscellaneous more recent trail updates scattered among some of my other trail pages, such as on this page about an area just south of Mt. Jefferson.